Perhaps the worst example I witnessed was when an editor ordered his subordinate to write a review based on an online video. It was for Clubhouse Games on the DS, a collection of classic board and card games. The editor's thinking was that his writer could glean everything necessary to pass judgment on the game simply by watching a gameplay video on YouTube. The review ended up being half a page with an average final score, and the game was completely overlooked by the readers. While cheating enables reviewers to quickly experience later portions of a game, the consequence is a loss of pacing and challenge. Rather than judging a game as a holistic experience, cheating puts the focus on easily accessed spectacle. These reviews may better present precisely what a game contains, but the skewed perspective that results from cheating makes accurate critical judgement more difficult and assessing long-term satisfaction with a game even harder. There are, of course, exceptions, since not all games have debug options. With print magazines, you can often trust early reviews of import games, which are sometimes bought using the reviewers' own meager salaries instead of relying on copies sent by domestic publishers. After I had bought the U.S. version of Metal Gear Solid: Portable Ops and completed it long before it was released in the U.K., the editor of PlayStation 2 Official Magazine - U.K., a man of genuine integrity, asked me to write a review of it, stating that he specifically wanted an honest assessment from someone who had completed it. 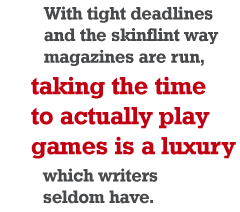 Unfortunately, with tight deadlines and the skinflint way magazines are run, taking the time to actually play games is a luxury which writers seldom have. What's the alternative? Having enough staff to cover each game properly while paying them enough to dissuade them from freelancing? Or asking reviewers to be honest that they've only given a 40-hour epic one-tenth of that time? Magazine publishers won't consider the former, and it's doubtful readers would accept the latter. It appears, then, that until something drastic happens in this corner of the industry, cheating will continue as a way to maintain the illusion of comprehensive and accurate coverage. John Szczepaniak is a South African-born journalist, formerly employed by a British games magazine publisher, and then afterwards by a Time Warner subsidiary which was paradise in comparison.